Apple's iPhone X demands not only a higher purchase price, but also comes with a more expensive AppleCare+ coverage charge. If you managed to snag a copy, you'll want to spring for the warranty plan. AppleInsider explains why. When preorders for the iPhone X opened, it only took ten minutes for shipments of Apple's flagship device to slip beyond the scheduled Nov. 3 launch date. An hour later and those estimates rose to 4 to 5 weeks. It's not surprising, as the hotly anticipated handset boasts a complete redesign with Apple's first edge-to-edge smartphone OLED screen and advanced facial recognition technology. In fact, production of the screen and Face ID sensors are believed to be main causes of iPhone X supply shortages. Dropping and shattering your iPhone's screen isn't the same anymore. With iPhone X, you now run the risk of damaging not only the Super Retina OLED, but also the sensitive TrueDepth camera that powers Face ID. Without that, you've pretty much got a cracked iPhone 8, but without Touch ID, leaving a manually-entered code as your only means of unlocking the device. To make it even worse, if you don't have AppleCare+, it will cost you $279 to replace the screen, $110 more than iPhone 8 Plus. 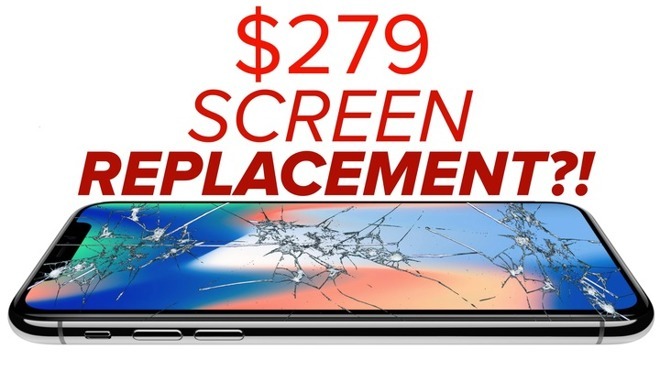 On top of that, it costs $549 for other iPhone X repairs like liquid damage, more than half the price of the iPhone itself, and $150 more than the same repair on an 8 Plus. Although AppleCare+ costs $199 for the iPhone X, it's only $50 more than on the 8 Plus. We argue the cost to benefit ratio is worth it. With AppleCare+, you pay the same $29 premium for screen repairs, just as you would for any other iPhone. And the same goes for more serious iPhone damage, with out of pocket costs coming in at $99. Users who don't like using cases and trust themselves enough to not need AppleCare+ should really think twice when it comes to the iPhone X. Anything could happen, and you could be left with a broken TrueDepth camera. The $199 price for AppleCare+ might sound a bit hefty, but if you factor in not needing a screen protector and case, that's a minimum savings of $60 if you're buying directly from Apple. If you are planning to buy AppleCare+, you should definitely be purchasing the iPhone X using Apple's iPhone Upgrade Program. It's basically an interest-free loan, so you'll pay exactly the same amount as you would if you bought the combo outright. So that means the $199 for AppleCare+ becomes $8.29 a month, the same price as a couple coffees. The best part of the deal is that you can upgrade to next year's new iPhone release completely free of charge. The iPhone X with included AppleCare+ and free iPhone upgrades every year will run you just under $50 a month before taxes.